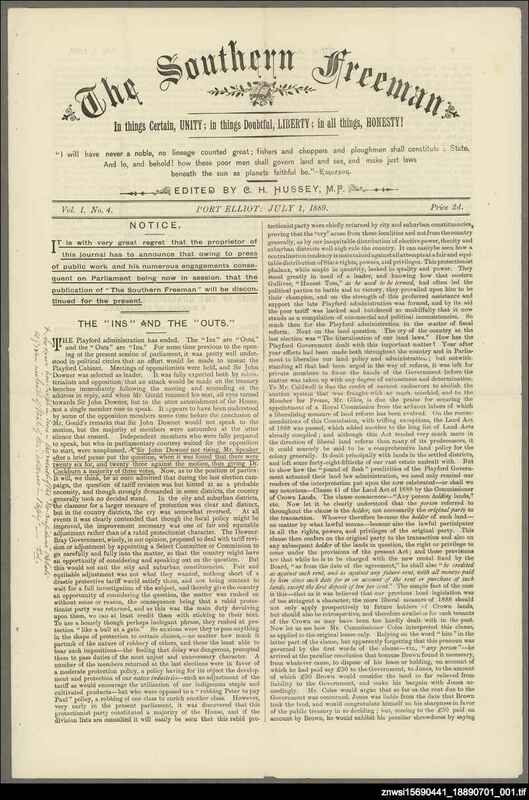 When Charles Hussey was voted to South Australian Parliament as a representative for Encounter Bay, he began publishing the monthly Southern freeman largely as a platform for his political aims. One thousand copies were distributed free in his electorate. Hussey had some firm and even some unusual political opinions. Listed in the first issue of his newspaper, these included the call for a single chamber parliament, support of Federation, abolistion of all pre-nominal titles including 'Reverend'. Hussey was a member of the River Murray Royal Commission, voicing issues which remain the same for South Australia's use of the river today. He was not re-elected when his term finished, but continued running his general store at Port Elliot until his death in 1899.